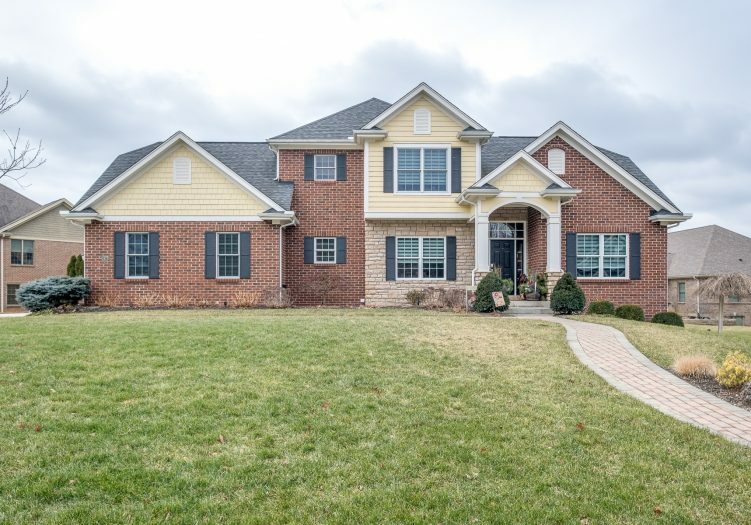 Home » Listings » Custom Home in Stonehill Village! Custom Home in Stonehill Village! AH-MAZING custom home in sought-after STONEHILL VILLAGE! Original owners have METICULOUSLY MAINTAINED this American Homecraft two-story! A PAVER PATH leads guests to the foyer with sharp, white trim and TILE floors. The formal DINING ROOM to the left provides fabulous entertaining space. WOOD FLOORS, a cathedral ceiling, and GAS FIREPLACE make the great room the heart of the home! For the cook, the contemporary kitchen boasts GRANITE, a STAINLESS HOOD, wall oven, TILE BACKSPLASH, and breakfast bar. A MAIN-LEVEL MASTER features a luxurious bath with jetted tub, DUAL-SINK VANITY, and tile shower! Upstairs, you’ll find three more bedrooms and a full bath. The lower level offers a finished BEDROOM SUITE with bath – ideal for in-laws or older kids – plus plenty of UNFINISHED SPACE for a future rec room! Outside, enjoy a COVERED PATIO, 3-car garage, EXTENSIVE LANDSCAPING with lighting and IRRIGATION, and invisible fence. HOA covers POOL, fitness center, TRAILS, basketball, and playgrounds!